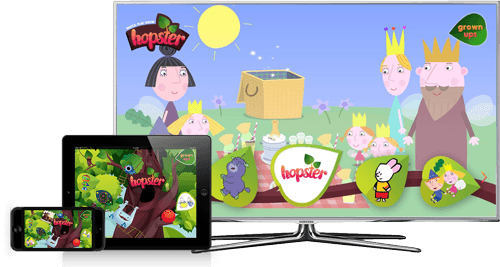 Hopster is now available at a TV near you! Our TV app is now available on Freesat’s connected TV service Freetime and soon on the new EE TV and Amazon’s Fire TV. We’re super excited to announce today that we’re hopping onto the TV with our first TV app on Freesat’s Freetime product, and lots more (like EE TV and Amazon Fire TV!) to follow in the coming months! Hopster’s TV app is now available on Freesat’s connected TV service Freetime and will launch shortly on multiple other partner platforms, including the new EE TV and Amazon’s Fire TV. This will bring our award-winning line-up of content to over a million UK households. When we launched our iOS app back in December last year (which has now been downloaded by over 180,000 families, no big deal), we dreamed of bringing Hopster to the TV – after all, our mission is to make screen time better, and even though kids are moving to touch devices more and more, the TV is still the #1 screen in the family household. With our new Hopster TV app on Freetime, we’re bringing hundreds of lovingly-curated episodes of family favourites such as Bob the Builder, Ben & Holly’s Little Kingdom, Pingu, Max & Ruby, Angelina Ballerina and many more to living rooms across the nation – all in one safe, ad-free environment that’s easy for kids to navigate! You can read the full press release here, find some press imagery here. For customer queries, get in touch on Facebook and Twitter, or check out our Help Desk!